We need consent so that we can analyse and publish the programme results. You do not have to do this to take part in the programme. Stockton Heath Medical Centre, The Forge Stockton Heath. We would like to use anonymous data to help us and other doctors and nurses learn what can be done with low carb ways of eating. In this way, we hope that the knowledge of this method will spread throughout the country, enabling better health for many more people. If you consent to sharing your anonymised data please sign a consent form and give the form to me when we next have a group meeting. I hereby consent to the anonymous sharing of my data as part of the 8 week low carb behavioural change programme. After that we will have a break for the Winter and evaluate how it has been received, and how well it has worked. If you cannot manage stairs I will do a separate group 12.30-1.30 on the same days downstairs- just ask me via email or reception. Modern life can have a significant impact upon us being active. Would YOU like to do something different to watching TV, playing computer games, and eating convenience and fast food? It is all about YOU so it is your choice! Being overweight and underactive isn’t just about the way you look. You KNOW can lead to more aches and pains, problems sleeping and a loss of energy and confidence. You KNOW it also increases your chances of getting heart disease, type 2 diabetes and some cancers. But by eating differently and moving more – two simple changes –YOU can reduce the associated health risks and live longer. Eating well means being smart as to what IS HAPPENING TO YOUR BODY HERE AND NOW in response to what YOU are eating and drinking. Is it working for you? Do you feel well? Moving more keeps your heart healthier, reduces the risk of serious illness and strengthens muscles and bones. It can also be a great way of lifting your mood if you’re feeling down. Do you need to move more, or are you doing enough already? Try these healthy eating and moving tips to help you make healthier choices. •	Base your meals on starchy carbohydrates only if that works for you and you stay nice, slim and free from illness. Once you are overweight, pre diabetic or diabetic you can ask me or your dietitian for a lower carb plan if you want, as recommended by NICE (low GI, individualised choice). A great one is on www.diabetes.co.uk and see your dietitian for more details if you need them. •	Eat lots of vegetables that grow above the ground and fruit like berries if that works for you( not everyone wants to eat fruit or veg- some people are zero carbers!). If you dislike fruit, just eat vegetables for less sugar and calories. Do not drink your calories- eat the whole vegetables and fruit as the fibre keeps you full for longer. 5 a day is something that is recommended, but not necessarily affordable or desirable for YOU, and not all fruit and vegetables are the same. Stick to the lower sugar/lower starch varieties for a lower blood sugar. Fish is a good source of protein and contains many vitamins and minerals. Aim to eat at least two portions of fish a week, including at least one portion of oily fish, or more if you do not eat meat. Tinned will do nicely, but fresh is even better. •	Cut out fat and sugar combinations like in cakes, biscuits, pies and pizza. They are terribly more-ish. Eat good fats instead as in olive oil, oily fish, walnuts, almonds and avocados. You do need healthy fats! •	The best way to eat less salt is to avoid processed food. Most people think of processed food as cakes and biscuits, but pies, cereals, and breads all contain salt. People with high blood pressure are more likely to develop heart disease or have a stroke. If you eat completely unprocessed food, there is so little salt that you may even need to add some in to keep your blood pressure up. The maximum is a teaspoon a day if you eat completely unprocessed food. Being active doesn’t have to mean hours at the gym, for example, try getting off the bus one stop early on the way home from work, and walking. Tai chi and yoga are getting very popular in Warrington- would you like to give one of them a go? We need to drink plenty of water to stop us getting thirsty–do you need 6-8 glasses a day? Count them and see. Tap water is much more affordable, and possibly safer, than anything out of a bottle. 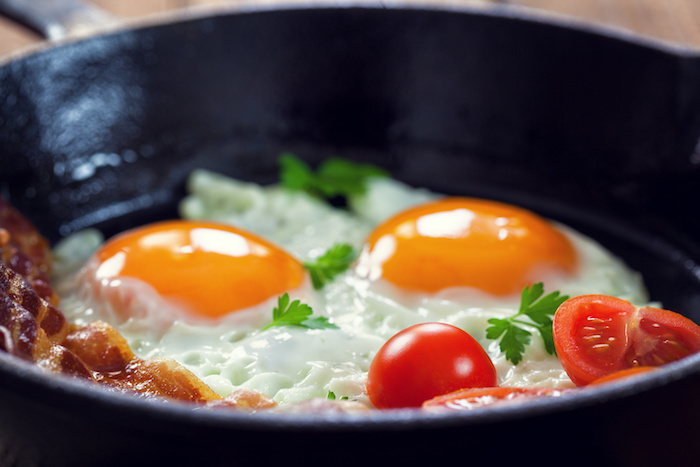 Some people skip breakfast because they think it will help them lose weight. In fact, some research shows that some people who regularly eat breakfast are less likely to be overweight. Other research shows that people who never eat breakfast who are asked to eat it every day, do put on weight. I say go with the flow of your natural inclination. If you feel hungry, eat. There is something called time restricted eating where people eat only two meals a day and no snacks. With lunch and evening meal or breakfast and evening meal only, many people become a normal weight. Eat at a table with a knife and fork and take your time. Addicted to processed food? Set a quit date and give it up, like giving up smoking… don’t give up on giving up!! 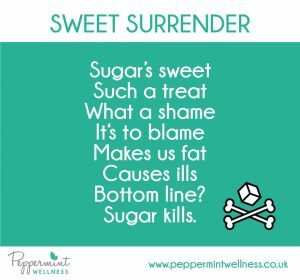 You will already try to avoid sugar, but look for hidden sugar- and avoid anything ending in –ose. Labels wise, look for the amount of sugar in grams and divide it by 4- that gives you how many teaspoons of sugar in that portion. And watch your portion- you may be eating double. Be mindful of what you are doing and if it is working here and now for YOU!